A “Quilt of Valor” which will be presented to a local veteran during a special service on Veteran’s Day. 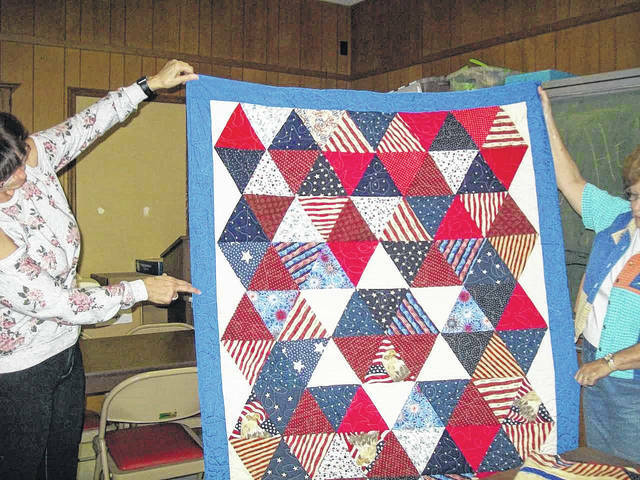 The Quilts “N Things Quilt Guild, with member from both Mason and Gallia counties, met at the Mason County Courthouse Annex on Oct. 3. A thank you letter was read from the Ronald McDonald House in Charleston, W.Va. for the guilds donation of 20 baby quilts in September. Daryl Salisbury from Gallipolis, Ohio was on hand to sharpen scissors for the members. The program was presented by Garnet Schwarz and Marie Dulaney. They instructed members and gave out instruction sheets on how to make Prairie Points. They had examples of this project in various stages of the construction and the completed Prairie Points were very pleasing, according to members. Plans were made for the Thanksgiving Feast to take place at the November meeting and also for the December activities. Members were reminded that the 2017 Challenge would be due at the November meeting. Several Quilts of Valor had been completed and were shown. These will be presented to local veterans at a special service on Veteran’s Day. For show and tell: Catherine Yauger showed a “Down on the Farm” quilt top and a Thanksgiving block. Present at the meeting: Karen Thomas, Mollie Yauger, Garnet Schwarz, Catherine Yauger, Carolyn Litchfield, Frankie Bumgarner, Sakina Doctor, Karen Jodon, Liz Rickard, Lucy Cullen, Marie Dulaney, Daleanna Langford and Jane Coles.